This is high profile comfort and protection in a low-profile design. Fully revamped, the Fang Gel Max Power Mouthguard features a tight, natural fit and a reinforced inner grid worthy of any sport. Power on. Heavy duty rubber frame provides impact protection. Custom molds to teeth for a tight, comfortable fit. 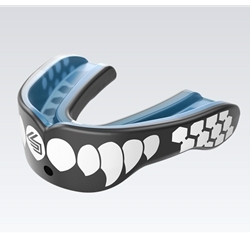 Our Multi-Layer Construction with an internal shock-absorbing frame offers protection and fit that outperforms conventional mouthguards.